Several episodes of anaphylaxis manifested as intestinal/abdominal pain, vomiting, diarrhoea, generalised urticaria, acute dyspnea, pruritis, sneezing, nasal obstruction, general malaise which required emergency treatment. Episodes occurred 2-3min after eating multigrain bread (Lezaun et al 1998 ). Anaphylactic reaction after one spoonful of linseed oil: ocular pruritis, weeping, strong palmar pruritis, generalised urticaria, nausea and vomiting (Alonso et al 1996 ). Anaphylaxis in one patient (Strickler et al 1986 ). Tingling and burning sensation of lips and tongue, swollen tongue and throat, vomiting, conjunctivitis and conjunctival and eyelid oedema, scratch test positive to proteins from flax in one patient, same symptoms and generalised urticaria in another (Black 1930 ). Protocol: (controls, definition of positive etc)Prick-Prick test with linseed. The positive control was histamine, 10 mg/ml, and the negative control was phosphate-buffered saline (Alonso et al 1996 ). Single cases are reported by Strickler et al (1986) ; Alonso et al (1996) ; Lezaun et al. (1998)  and Leon et al. (2003) . However, Strickler et al. tested 102 patients. The patient reacted with 12x12mm wheal. This was considered positive although the negative control was 6 mm diameter (Alonso et al 1996 ). One patient gave a positive scratch test to proteins from flax (Stickler et al 1986 ). 5g of linseed incubated in 50ml phosphate buffered saline for 24 hours at 4C, with stirring. Extract sterile-filtered (Alonso et al 1996 ). Leon et al. (2003)  defatted the linseed with acetone before extracting with phosphate buffered saline. IgE protocol:RAST (Alonso et al. 1996; Lezaun et al. 1998) and CAP (Leon et al 2003). Number of Patients:Single cases are reported by Alonso et al (1996) ; Lezaun et al. (1998)  and Leon et al. (2003) . Linseed specific IgE was 2.16 kU/L with a total of 19 kU/L (Alonso et al 1996 ). Linseed specific IgE was 20kU/L with a total of 221 kU/L Leon et al. (2002) . Immunoblotting separation:Leon et al. (2002)  used 1D SDS PAGE with a 10% separating gel. Samples without reducing agent and mercaptoethanol reduced samples were loaded at 40 µg/lane. Immunoblotting detection method:Proteins were transfered to PVDF membranes and IgE binding was revealed with goat anti-human IgE (Leon et al. 2002 ). One major allergen was identified before reduction running at 56 kDa which ran at 28 kDa after reduction. Leon et al. (2002)  suggest that the allergen is a dimer. Immunoblot showed allergens of 150-175 and 90-100 kDa before reduction and 35-100 kDa after reduction. Reduction reduced binding (Lezaun et al. 1998 ). IgE from patient bound to five protein bands 20, 22, 30, 35 and 38kDa. It was suggested that the 22kD protein was the main allergen (Alonso et al 1996 ). Allergy to linseed was one of the first food allergies described in the modern literature (Black 1930 , Grant 1931 ). 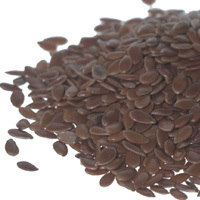 Leon F, Rodriguez M, Cuevas M.
The major allergen of linseed. Anaphylaxis caused by linseed (flaxseed) intake.